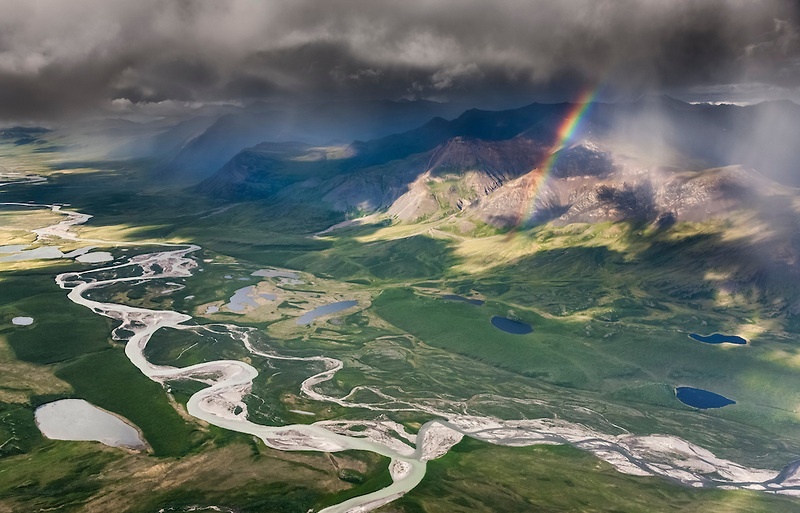 Located entirely north of the Arctic Circle, Gates of the Arctic National Park is the northernmost park administered by the National Park Service. At more than 7.5 million acres, it is a vast, mountainous region roughly the size of Switzerland, and almost 95 percent of the park is wilderness. There are no established roads, visitor centers or other facilities in the park, but if you are looking for solitude, this is where to find it. 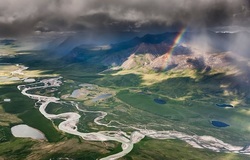 Gates of the Arctic National Park is wide open country. No roads, no visitor centers — just you and the great outdoors. Not surprisingly, this park rewards the self-reliant. Backpacking and camping are popular activities, but the lack of established trails and amenities means that hikers will have to bring everything into the park that they need, and be able to plot their route using a map and compass or GPS. Because of the prevalence of dense vegetation and swampy land, the easiest hiking is above the tree line or along rocky stream beds. Generally, you should manage your expectations about how far you can make it in a day while in the arctic. Five to eight miles per day is considered a good day of backpacking. Hunting is allowed in the preserve, but not within the national park. Hunters must abide by Alaska state game laws. Birding is popular in the summer, when many migratory species take advantage of the endless sunlight. The park is open all year round, and there are no facilities, reservations or entrance fees. Most people that come arrive by bush plane. If they wish, visitors may file a voluntary trip registration with the Alaska state troopers. It’s recommended — as long as you’re out in the wilderness, it’s not a bad idea to let someone know where you plan to be. Getting to the park is an adventure in and of itself, and pre-planning is of the essence. Think of yourself as an explorer striking out on an expedition. What are your objectives? What will you need? Are you prepared for unpredictable and variable weather? How do you contact help if you need it? Do you know what to do if you encounter a bear? Also, keep in mind that because the park is above the Arctic circle, it receives 30 days of continuous sunlight during the summer. During the long, harsh winter, the temperature plummets and darkness abounds. Grizzly bears inhabit the Brooks Range, so it’s of great importance to store your food properly and to try and avoid bear encounters. Unfortunately, some bears in the park have developed a taste for human food. Petroleum products like fuel and even bug spray in aerosol cans can tip bears off to where food potentially might be, and therefore pose a hazard to backpackers in the wilderness. Defensive firearms may be carried in the park, but must be used only as a last resort when being attacked by a bear. Archeological evidence in the park suggests that nomadic hunter-gatherers were the first humans to roam the Brooks Range, the mountains which cover most of the park. These people — the Inupiaq and Athabascans – crossed over the Bering land bridge from Asia during the last ice age, about 10,000 years ago, and forged a way of life out of the harsh landscape: hunting sheep and caribou, fishing, and trapping small game. Their descendants still inhabit small subsistence communities in and around the park. American exploration of the Brooks Range came in the 1880s, when “military explorers, gold prospectors, government scientists helped to fill in what had been a large blank space on American maps.” One of these people, wilderness advocate Robert “Bob” Marshall became an early and fervent supporter or setting aside a large part of the central Brooks Range as a National Park. Gates of the Arctic was established as a national park in 1980. 1929 – Famous American forester Robert “Bob” Marshall coins the name “Gates of the Arctic” upon discovering a pass between two mountains on the North Fork of the Koyukuk River. 1974 – The 414-mile Dalton Highway to the Alaskan interior opens. It comes within five miles of the park’s eastern boundary, making it the only road near the park. 1978 – Gates of the Arctic National Monument established. 1980 – Gates of the Arctic National Park established. Click to see a detailed Gates of the Arctic National Park map.